Dr. Jerald Koepke has been practicing medicine in Denver since 1980 when he joined Dr. John Selner at the Allergy Respiratory Institute. On January 1, 1997, the Colorado Allergy and Asthma Clinic merged with the Allergy Respiratory Institute to create Colorado Allergy and Asthma Centers. Dr. Koepke was excited about the blending of these two nationally recognized practices and the expanded opportunities for patient care through extended services, education, and research. Dr. Koepke is certified by the American Board of Allergy and Immunology. He is a graduate of the University of Illinois and of the Illinois School of Medicine. He completed his residency training at the University of Michigan before entering the U.S. Navy for two years. He studied allergy and immunology at National Jewish Hospital in Denver. He served on the senior teaching staff at the Asthma Center before entering private practice. 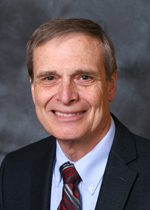 He is currently an Associate Clinical Professor at the University of Colorado Health Sciences Center. He is also a Fellow of both The American College of Allergy, Asthma, and Immunology and The American Academy of Allergy, Asthma, and Immunology, the two national organizations recognizing academic achievements of physicians in his field.